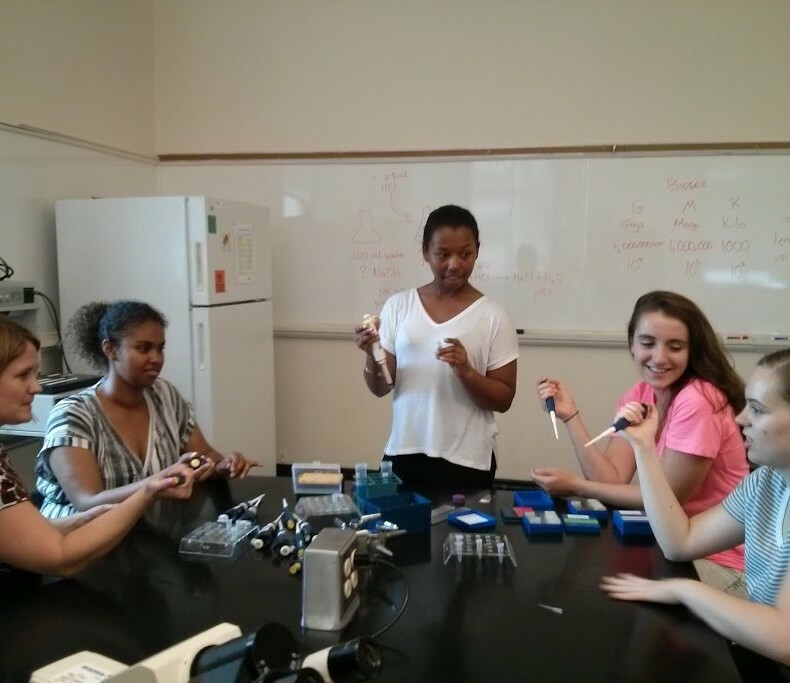 From left to right are Meg Bentley, Hodon Saeed, Shakira Saleem (UTA), Sarah Cammarata and Brynn Bruder all practicing how to pipette. At the Gordon Conference on Undergraduate Biology Education Research in July 2015, Meg Bentley (American University) presented data demonstrating the effectiveness of an Undergraduate Teaching Assistant (UTA) program. Genes to Genomes asked her to give us some advice on the development and execution of such a program. Imagine a biology lab in which students work in pairs to determine the characteristics of a water sample by measuring oxygen levels, magnesium and pH. It’s a beautiful lab that meets the standard of Vision and Change – it is real-life, it is inquiry based, it is messy – really, really messy. In our labs at American University and many other institutions across the US, an inquiry-based laboratory often means that a lone, (typically young) graduate student is tasked with managing up to 24 undergraduates with majors ranging from political science to dance to economics. The grad student must corral these undergrads through a series of stations urging them to pipette accurately, dispose of sulfuric acid safely, and get through all the stations in time – all of which are cookbook-style lab course elements not recommended in Vision and Change. To alleviate this problem and restore our focus on engaging students in making observations, asking real-life questions, and focusing on data and evidence, we decided to add a second person to technically-intensive labs–specifically, an undergraduate teaching assistant (UTA). UTAs are undergraduate science majors. They are assigned to a lab section and attend 6 (or just about half) of the labs in a particular semester. The UTA is there to answer questions about anything – “how does this thing turn on? Do we need a positive control for every assay? How did you get interested in science?” They don’t get paid and they don’t grade – they simply come and exemplify a passion for doing science. At American University, we use UTAs in our non-majors biology course and our two introductory majors courses. We have asked the UTAs and the students in labs served by UTAs about their experience and it is a win-win (win win win!). Similar to other seminal programs like the Colorado Learning Assistants (CLA) Model, our UTAs report gains in confidence in troubleshooting, communication, and scientific knowledge. UTAs frequently become mentors to their peers and enhance their relationships with faculty and the department. Surveys indicate that more than half of the students interact with UTAs at least 6 times during the semester–and all respondents reported that these interactions are helpful! Reasons for interacting include discussion of results, explanation about assignments, and clarification on how to use equipment. Students in our majors courses also report using UTAs as mentors who answer questions about curriculum choices and study strategies. The fact that most UTAs re-enlist, despite being volunteers, demonstrates the ongoing value UTAs place on this experience. Recruit UTAs thoughtfully – the best UTAs are the ones who enjoy being in the lab and aren’t scared of “messy.” We don’t select UTAs based on grades. Encourage the UTA to discuss their expectations and goals with the graduate student(s) they will be assisting. Each UTA will have unique expectations and strengths – remind your TAs of this. Train the UTA in safety and content, ideally alongside the TAs. Communicate regularly with UTAs – This is why Facebook was invented! After 3 years of emailing UTAs about training and other issues, we created a Facebook group and now I get responses in 2 minutes rather than 2 days! Create and distribute a description of the UTA role and responsibilities for students’ resumes. Sing the praises of the UTA in your department. Make sure your colleagues know what a UTA is and does. Assess the effectiveness of UTAs– remember to talk with your Institutional Review Board (IRB) before doing student surveys. It’s okay if they don’t show up – UTAs are busy undergrads too. We think of UTAs as cherries on an ice cream sundae – if they are not around, then you still have a pretty darn good dessert.